Please note: the venue for this event has changed. This event is now at The Clarice in the Gildenhorn Recital Hall. The energy of a rock concert, the sophistication of classical music and the accessibility of interactive technology meet in this high-energy ensemble. With exceptional talent and quirky artistry, they combine the driving intensity of drums, the warmth of marimbas and vibraphones, and the surprisingly exotic sounds of everyday objects to make music that is playful and profound. They’re known for ground breaking collaborations across a wide range of disciplines, including concerts and residency projects with engineers, architects and astronomers. 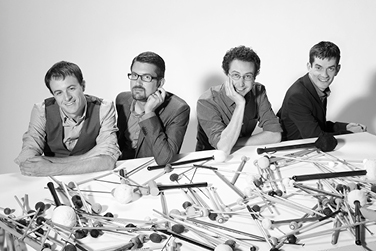 This performance of Third Coast Percussion is funded in part by The Randy Hostetler Living Room Music Project and Fund and the Amphion Foundation. Join the artists for a conversation following tonight's performance.